At the beginning of this review blog I set out to investigate and review eco-friendly garden cleaners. I wanted to find out all the lovely sustainable ingredients that people were using to safely rid their greenhouse and gardens of bacteria and then share with you guys – my findings are far for what I envisaged. In this day and age gardeners and growers want safe sustainable disinfection options. In order to achieve organically produced fruit and vegetables, in the truest sense of the word, gardeners are making changes in the way they do things. Instead of buying manufactured fertilisers, gardeners are using cow dung straight from the farm. When it comes to pesticides, growers are looking for natural and safe alternatives to harmful chemicals. We know that it is extremely important for growers to move towards using products that are as environmentally friendly as possible, and we also know that It doesn’t stop at the growing stage; Eco-friendly garden cleaners are needed to stop the spread of disease before the plants have even been potted. Summer lasted, for what felt like a decade. The plants in your garden were blooming, the vegetables grew to sizes never seen and autumn brought a bountiful harvest. Over the winter months, while you enjoyed the fruits of your labour, you start to put your plans in place for next spring. Your greenhouse is home to hardy crops such as grapevines, turnip, sprouting broccoli, leeks and chard; all ready to flourish in the New Year. First things first though, the polly tunnels and outbuildings need to be cleaned. Water butts need to be disinfected and tools and equipment need an overhaul to serve you well in the coming months. You don’t want any bacteria that may have built up over the winter months, affecting this year’s projects. When it comes to your garden spring clean, what happens when you come across a task or problem where gardening cleaner or disinfectant is the only solutions? A lot of blood, sweat (and sometimes tears) goes into keeping a garden, greenhouse or yielding plot of land and the last thing you want is for your good intentions to backfire by using a harmful product or the wrong product for the job. We have done the online research to let you know what products are available to you. Why? So that you are armed with all the information you need to make that important decision – the life of your spuds depends on it! I am not going to lie; this was not an easy task. In order to get the information we have pulled together it took longer than I envisaged; why is this, why was it so challenging? The Eco-friendly garden cleaning products out there were thin on the ground, sparse…… actually verging on non-existent! In the interest of being open and transparent we want to let you know that we have included our own product in this review to show you what is available on the market; our review is impartial and based on fact and information available online. 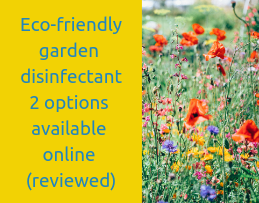 What eco-friendly gardening disinfectant is available online? 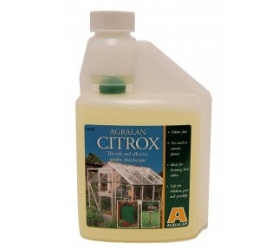 Agralan is a cleaner made from the by-products produced when extracting the juice from oranges. The predominant ingredients are Citric Acid and Ascorbic Acid (vitamin C) these are both food grade materials therefore have not adverse effects on humans. These 2 ingredients are then mixed with water. It is difficult to give an exact % ratio of these 3 ingredients due to the extracting process. I was really impressed by the follow up from Alan and his team, his phone call allowed me to understand more about his product and introduced an element of trust surrounding Agralan and their brand. Product safety: On the company’s website there was no reference to any safety precautions needed by the user, however on an alternative selling website we did find that there was a warning for purchasers to let them know that Citrox can be “irritating to eyes”. Effective against a wide range of bacterial & fungal diseases. As it does not harm plant material it is not necessary to remove plants from the greenhouse when using. It can also be used to disinfect the water used to wash cuttings, bulbs, corms etc. When used as directed, Citrox should not harm insect predators used for biological control. How long does it take to work? Pots, trays and small tools should be completely immersed in a dilute solution for at least 10 minutes. Capillary matting and sand beds should be thoroughly drenched with the dilute solution once a month. Is the packaging recyclable? The product comes in a plastic bottle however it was not clear to see from the website if the packaging was recyclable. Agralan have confirmed that the plastic bottles are recyclable. 500ml concentrate makes 10 litres of disinfectant solution. Bacteria: Effective against blight and mould spores and poses no risk to crops therefore fruits and vegetables can remain in situ when cleaning is being carried out. Waterbutts: ESOL has been approved by the DWI (The Drinking Water Inspectorate) for the use in drinking water. Providing there are no leaves or organic material in the water itself, ESOL can be added directly to the water, this will kill all bacteria leaving the water completely safe. Bird houses and feeders: After removing any bedding, food and debris ESOL can be sprayed onto houses and feeders to eliminate any bacteria build up. Planting trays: Remove all soil, pebbles and bedding mats, wipe with a damp cloth to remove any remaining organic material and then spray with ESOL. This will kill any bacteria that may cause disease in new plants being potted. 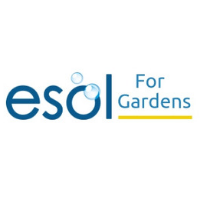 All though ESOL for gardens is a very versatile, safe sanitiser there are some points that need to be taken into consideration before use. The corrosion of low grade metals such as tin, zinc, iron and aluminium can be accelerated should ESOL come into contact with it however, rinsing off after use will eliminate this process. How long does it take to work? The recommended contact time is 10 seconds and if ESOL is not rinsed off there is a residual kill. Whether or not the products are out there but the information is just not available online. Is it a case that there is actually a huge lack of environmentally friendly, safe garden disinfectants on the market? If the latter is the case, it can only highlight the issues that growers are faced with when looking for a sustainable, effective disinfectant. Yes, ESOL™ is our product so it would stand to reason that we are able to provide more information surrounding the product, however in the interests of fairness we did not include any information in this article that is not available on our website. Calling Agralan was 'above and beyond' the normal process of a review blog but seeing as we only had 2 products to review I thought I would give Citrox a fighting chance. Today’s consumer’s first port of call for purchases is online; if your product information is not available you will not be found. Have I missed something glaringly obvious? Do you use an safe, eco-friendly garden disinfectant that I have not come across? Or are you using a product at the moment that you could recommend? Want it direct to your inbox?